Water film attenuation of over 5dB in radio reception may occur at water film thickness of 0.15mm and radio frequency of 12GHz. Rainfall forms water film on antenna surfaces. The water film may cause water film attenuation in radio reception. The water film attenuation is calculated for radio frequency of 3 -25GHz and water film thickness of 0.05 - 0.20 mm. Water film attenuation increases with thicker water film and higher radio frequency. Attenuation is over 5dB at water film thickness of 0.15mm and radio frequency of 12GHz. 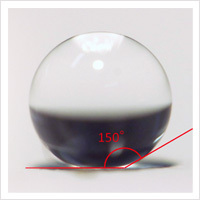 A common rainfall of 10 mm/h intensity may form a 0.16 mm thick water film on a radome (*2). The common rainfall may cause up to 5dB water film attenuation in radio transmission. Antenna surface may be deteriorated during long term outdoor usage, which causes thicker water film on its surface. This may increase the film attenuation even with the same rainfall intensity. Super water repellent material HIREC prevents water film on antenna surface and is an effective countermeasure against heavy rainfall. *1: N Kodaira, et.al, Meteorological Research Note, No. 112, 1972, Meteorological Society of Japan (in Japanese). *2: N Kodaira, et.al, Meteorological Research Note, No. 139, 1980, Meteorological Society of Japan (in Japanese).